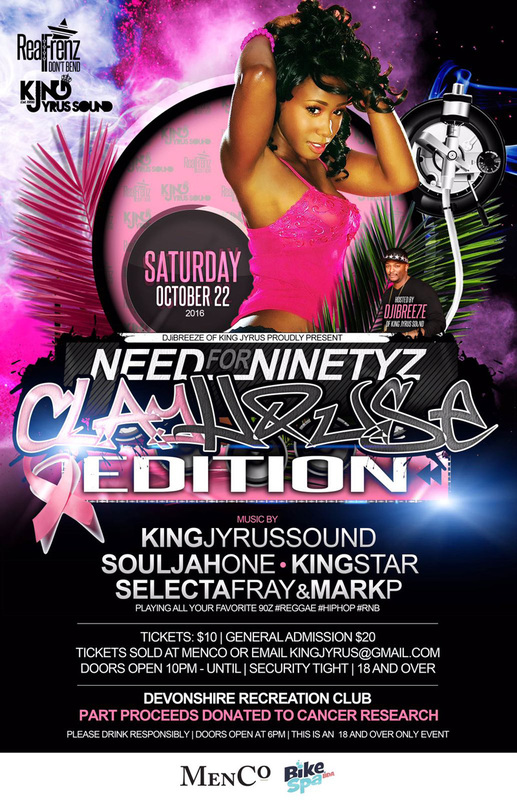 DJiBreeze of King Jyrus is getting set to present the N’eed for Ninetyz Clayhouse Edition’ event, taking place on Saturday, October 22 at the Devonshire Recreation Club, with part proceeds to be donated to cancer research. The event will feature music by King Jyrus Sound, Souljah One, King Star, Selecta Fray and Mark P, playing reggae, hip hop, and R&B favorites from the 90s. Tickets are available at Menco or via email kingjyrus@gmail.com.